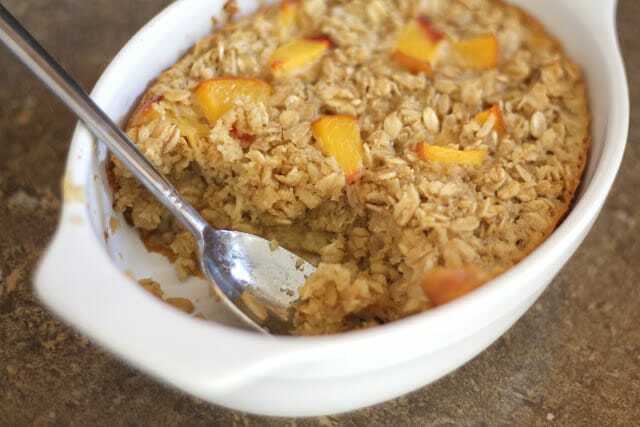 Peaches and cinnamon pair so perfectly with oatmeal, I’m surprised I haven’t baked a pan of oatmeal this way before now. Anytime I bake peaches into something it reminds me of peach cobbler. So, the fact that I loved this breakfast really shouldn’t come as a surprise. Of course, the fact that I want to make another pan of it tomorrow morning just goes to prove my addiction to the fresh peaches that are finally in season. Preheat the oven to 350 degrees. Thoroughly grease the muffin cups or pan with butter. 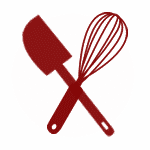 Combine the dry ingredients in a mixing bowl and drizzle with the warm butter, stir to combine. Add the eggs, stir and then add the milk. Stir to combine everything and then stir in about 2/3 of the peaches, reserving a few peaches for the top of the oatmeal. Scoop the mixture into the muffin cups or pour it into the pan. 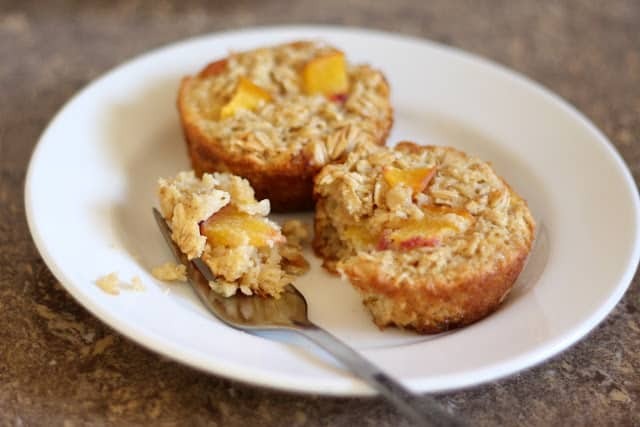 Bake the muffin cups for about 20 minutes, until an inserted knife comes out with only moist oatmeal crumbs. (A full pan of oatmeal will take about 35 minutes.) Serve warm and Enjoy! freezer bags or containers. Reheat in the microwave with a tablespoon of water. These look lovely! I'd imagine they would be really yummy with all kinds of different flavor combinations. Lovely oatmeal darling! I thought these were going to be individual crumbles. So adorable. LOVE this. you should try them as a cookie. AMAZING!!! I replaced them for the cranberries in my regular oatmeal cookie recipe and... d'lish! You can probably even "make do" in December with frozen peaches in this recipe. Nothing compares to fresh peaches, though. 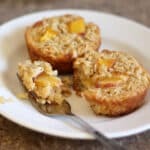 What a great way to enjoy baked oatmeal! Love this idea.